Showers this morning becoming less numerous during the afternoon hours. Thunder possible. High near 70F. Winds WSW at 10 to 15 mph. Chance of rain 50%.. Scattered thunderstorms early, then variable clouds overnight with more showers at times. Low 44F. Winds WSW at 10 to 20 mph. Chance of rain 60%. Twin Falls senior Faust Ystueta dribbles past Hillcrest senior Kyle Austin as he drives the ball to the net Saturday, Dec. 22, 2018, at Twin Falls High School in Twin Falls. Twin Falls defeated Hillcrest 59-47. 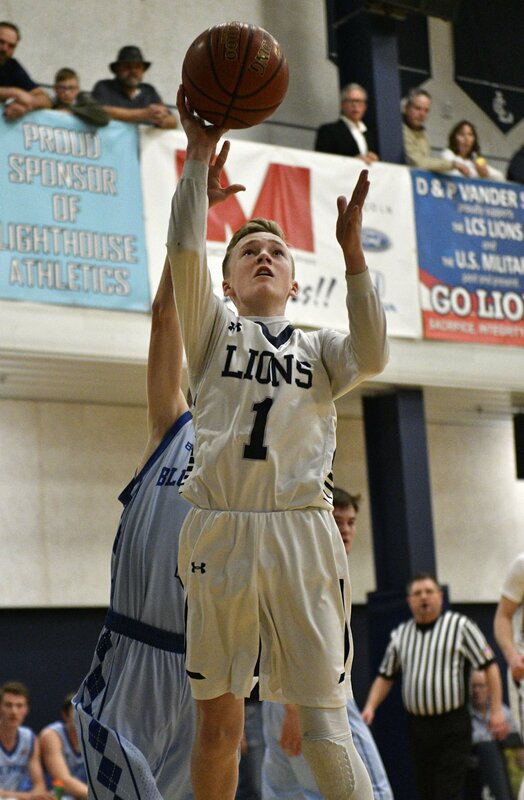 Lighthouse Christian's Collin Holloway shoots a short jumper against Dietrich during their game Friday night, Feb. 8, 2019, at Lighthouse Christian in Twin Falls. Just as high school boys basketball district tournaments begin across Idaho, the final state media poll of the season was released on Tuesday. After receiving the most first-place votes in last week’s media poll for the 4A classification, but still finding itself behind Preston, Twin Falls High School ends the season as the No. 1 team in the state in 4A. The Bruins (18-2), because of the Great Basin Conference’s ranking system, are the fourth seed in their district tournament, but were recognized as the state’s top team with five first-place votes out of a possible nine. The Bruins will kick off their conference tournament against Pocatello on Thursday. Only one other Magic Valley squad came in at No. 1, and it was unbeaten Lighthouse Christian (20-0). The Lions have been in the top spot for a number of weeks, and hold it down as they enter postseason play. Lighthouse Christian is the No. 1 seed in the Sawtooth Conference tournament, and opened it up with a 44-point win over Castleford on Tuesday. Back in 4A, Minico (17-4) dropped from No. 3 to No. 4, getting leapfrogged by a Century team that defeated the Spartans last Wednesday. Minico hosts Mountain Home in the district tournament on Thursday. Kimberly (17-3) had maintained the No. 3 spot in 3A for quite some time, but this week’s ranking came with a new twist. The Bulldogs received one first-place vote to tie with Parma for the No. 2 spot, while No. 1 Fruitland took the other eight. The Bulldogs have reeled off 11 straight wins since a one-point loss to now-No. 5 Sugar-Salem. Although Declo’s name reappeared in last week’s poll, with one vote given to the Hornets, they are back out as no local 2A teams made the top five.